Read more about what our clients have said about our boat cover products and services. Whether you need a boat frame or a power boat cover, you can count on us for exceptional services. Read what our clients have said down below. Thanks! The cover fits great and looks good too! Your guys did a super job with the install. Just a note of thanks for all your effort and consideration in modifying the dodger and cutting down the frame. I am most appreciative. Thanks for the quick and great work! Great job on the Dodger. You guys are the “Big Dogs” in town. I have just purchased my 2nd sailboat cover and the quality is the best. I also appreciate the high level of service that you provide. Thanks a million! I am very pleased with the cover but I was impressed by the crew that measured and installed it. Great job! Thanks! Thanks for the nice work on my sail cover, especially the extra stitching and quick turn-around. May all your seams be straight or curves as the case may be. Got the cover… shipping was about 5 days Tuesday to Wednesday and all arrived as expected. The following Sunday my wife and I got it up in about 4 hours. All went pretty well. We especially liked the way the cover just rolled out onto the frame… couldn’t have been easier. I want to thank you for an excellent cover. I contacted you first in January and after completing the order I received the cover in ten days. The cover went on that weekend and fit “like a glove.” It has survived several quite strong windstorms and snow storms while protecting the boat quite well. In the man time tarps around us have been disintegrating at a high rate. Thank you again for great service with a great product. I believe my contact as Erik—very personable on the phone. I wanted to let you know I received the cover back along with swatches of extra material as I had hoped. That was an amazingly fast turnaround. I have not opened the bundle of fabric but presume it was repaired as discussed. I honestly do not know how the fabric could have been rolled up so tightly. It was a beautiful job that I wish I understood how to duplicate next spring! I want to say I am pleased and impressed with both the product and quality of service at Fairclough. I have related this to other boat owners in the area and perhaps they will avail themselves of your services. My conversations with you on the phone have always been top notch and gotten the job done or the question answered. This is as I think all companies should operate. But this level of quality is rarely seen and rarely delivered with the personal attention I felt you gave me. So it deserves my time to mention it to you. My best regards to you and Fairclough. I look forward to doing business with you again in the future. I have sold the Fairclough Cover for yacht Aviana to Steven Dichter . I have spoken with you recently on the phone about this cover which you have in storage at Fairclough. Steve’s Email address is above and he will be contacting you in the near future. Steve is also the new owner of Aviana. If you need anything further from me on ownership transfer please advise. I would like to take this opportunity to thank you for the excellent service you have provided to me over the years and for making such a great product. Sorry we didn’t get back to you earlier. 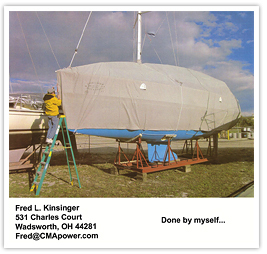 We appreciate your call to check on our process with the winter cover of our sailboat. We were battling 40 mph gusts, snow, and a couple of non-engineer-minded amateurs when we called in a panic on Saturday. As it turned out, we were able to get the frame together on Saturday and when it withstood the high winds overnight we figured it must have been sturdy enough for the cover. The cover went on smoothly (love the fold job!!) and it looks good and fits well. It is fullsized but we understand that is intentional to compensate for weather shrinkage. PS You can use our testimony that even in horrid conditions non-engineer-minded yahoos can put the cover together! Attached are a couple of pictures of my Seaward 32RK all tucked away for the winter in my front yard. The pictures were taken right after I put the new cover on and it has since tightened up nicely. The cover is perfect. I could not be more pleased with how it has worked out. I love how it breaths and is nice and roomie underneath…and my neighbors appreciate how much better it looks than a junky plastic tarp. You guys have been a pleasure to work with and you did a great job. Feel free to give my name to anybody who asks for a reference. Wanted to forward this photo of your cover on Andiamo (Passport 515). We had a record snowfall this year so far 55 inches – and the cover held up well. I do get lots of compliments about the cover from other owners and professional boat people. Excellent workmanship. It is great in the spring when I remove the cover and have a really clean boat—makes the launch prep a lot easier. I just installed my new Fairclough winter cover this weekend and I wanted to thank you and all the folks at Fairclough for an outstanding product and great customer service. My cover arrived at our marina in great shape and all in order. It was a quick 3.5 to 4 hours to install (had we not stopped for a quick beer to admire your product) I’m sure it would have taken even less time. A couple of our marina mates liked it to so I gave them your name and contact information and I have attached a picture for your review. I just wanted to take a minute to write you concerning my cover. I bought my 29′ Hunter “Selena” up in Clinton CT in the sprint and saw it with the cover on it once. I did not know how I was going to put it together in the fall because of all the pieces and no instructions. I spoke with Brice Schmaling at the Annapolis boat show and explained the situation to him. He spent at least a half hour explaining the exact process to me and gave me many tips that proved to be so important. My wife and I were able to put the cover on ourselves without any problems or arguments in about 3 hours. I wanted to let you know how thankful we are and commend him for his great customer service. Please let him know for us. I thought I would let you know how satisfied my wife and I are with the cover we bought last fall for our 1992 Hunter 33.5. I have attached two pictures of the boat with the cover on it. The first one is from the day the cover went on last November, and the second is two weeks ago, the day we removed the cover. The cover fit like a glove, and was just as tight the day we removed it, as it was the day it was installed. That says a lot after the record snowfall we had here in Wisconsin this year. We have gotten many compliments and questions about our new cover. I know of a few who say they will be calling you for a quote for their boat. Thanks for the great work on our cover. We are very happy with the decision to buy from Fairclough. Thank you for your fabulous customer service…you guys are awesome. The cover for my J 35C fit great and was a breeze to put on! Your product was so complete I was dumbfounded! You even included all the lines I needed! Totally unexpected but greatly appreciated! Great job and thank you!